There are so many delightful things about fall, but one of my favorites is what I call food hibernation – the canning and preserving of the ripe spring and summer foods that we will inevitably miss. San Marzano tomatoes are it for me. I cannot have enough during the hot summer months and I emotionally long for their return in winter. Good things canned tomato sauce was one of the first “recipes” I learned from my mom. I think an easier recipe cannot exist. Here is how it works. First of all, you will need a tall, non-stick pot, just like mine. Next, your mise en place: thoroughly wash the tomatoes, dice the onion or shallots, and have salt and pepper shakers handy. Now, the tomatoes. I like to cut them in half to see whether there are any areas that need to be discarded. It’s better to do this extra step, then to have to throw away precious sauce. Add the extra virgin olive oil, let it heat up for a couple of minutes and add the onion/shallots and let them cook for 3 to 4 minutes, or until soft. Add the tomatoes. This process usually takes some time, but the good thing is that you really do not have to continuously stir or look after the sauce. It’s like magic. NOTE: To make the sauce extra flavorful, I usually add a splash of white wine with the onion/shallots. 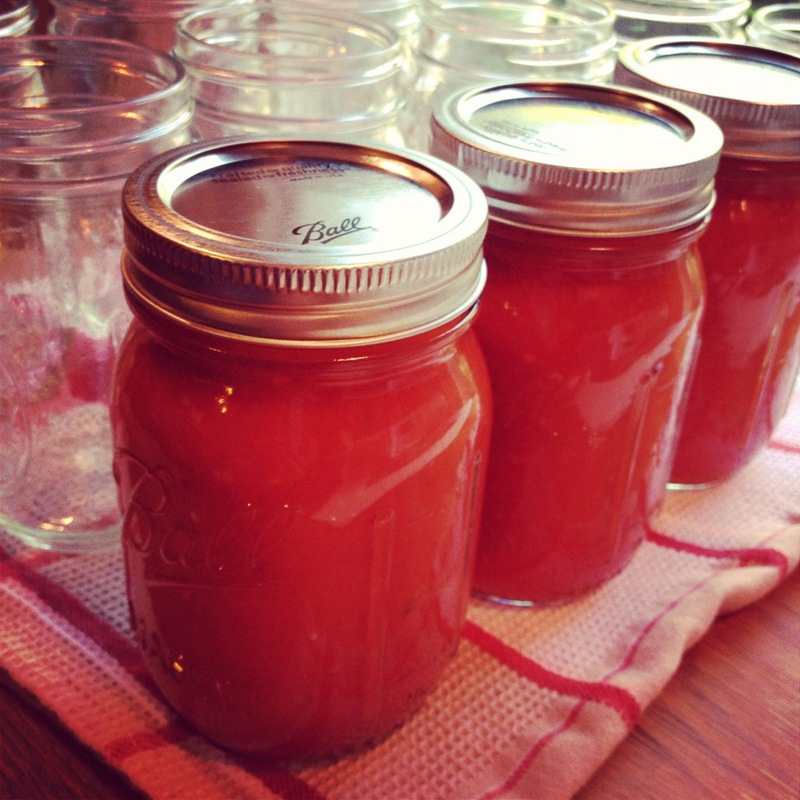 While the tomatoes cook, get the jars and lids ready to be filled. With two pounds of San Marzano tomatoes, I can easily fill more than 6 12 oz cans. Once the tomatoes are cooked through – the pulp is visible and their water is boiling – they are ready for the next step: the food mill. There are a lot of different food mills on the market and it doesn’t really matter which one you choose. The most important thing is to keep in mind that you need to crash a significant amount of tomatoes. 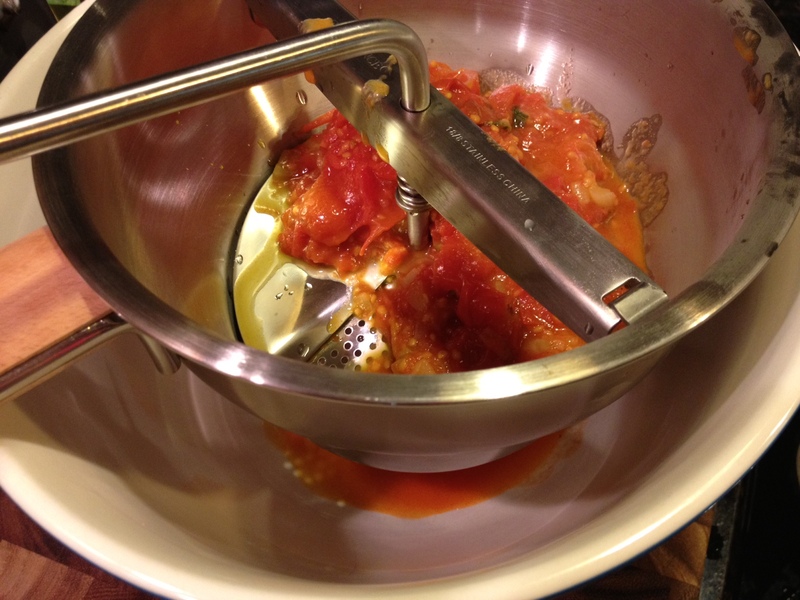 Pour a good spoonful of the tomatoes and start working the food mill until all the sauce or juice is extracted and is in the bowl. Repeat until all the tomatoes have been crushed. It is at this point that you are ready to can the sauce. 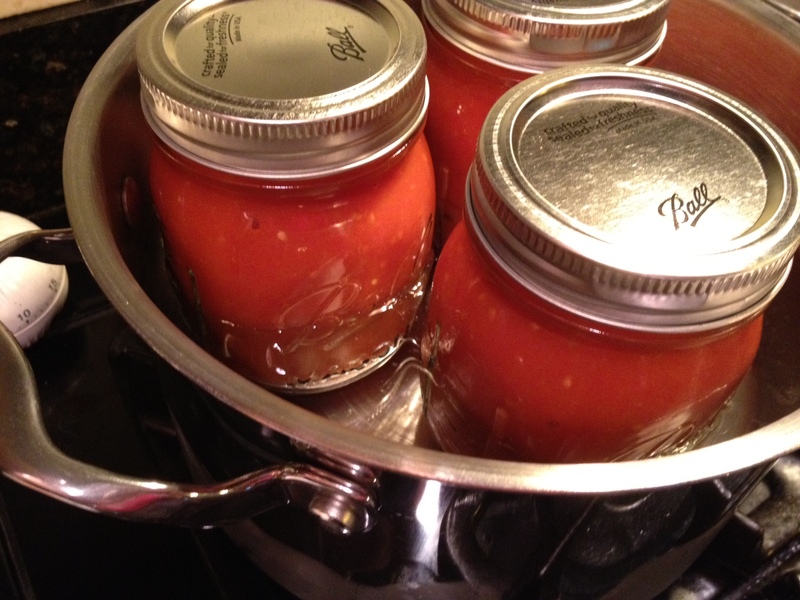 Fill each jar to the brim and close its lid extremely tight. Repeat it until you have no more sauce. In case you have some leftover sauce that won’t fill a jar, put it aside, refrigerate it and use it for some fresh pasta sauce. Once the jar are full, place them in a saucepan with a little bit of water. Turn on the heat and let the jars “cook” for about 25 minutes. This step ensures that the jars will be properly sealed. NOTE: While the jars are in the boiling water, they may rattle and make a bit of noise. One tip from my mom is to add a towel in the water within the jars. The water boil and you won’t hear a thing! Let the jars cool and you are done. It is really this easy. Happy canning! 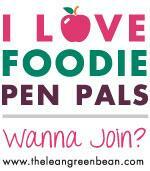 Let me know how your favorite canning recipes! Buon Appetito! !